Small to mid-sized business or enterprise organization—we all want the same thing—predictable sales results and growth. Consistent growth requires a consistent, systematic process that delivers consistent, dependable results. How do you achieve this? With a system that guarantees results. Struggling with using LinkedIn to generate new business? 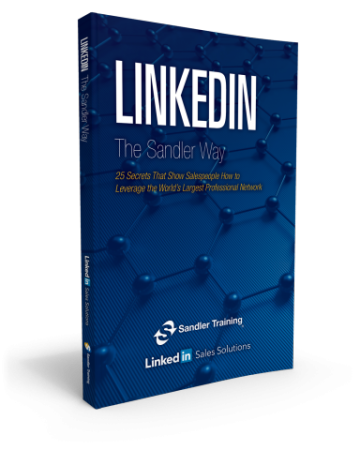 Sandler and LinkedIn teamed up for this joint book publication, LinkedIn the Sandler Way. Experts from the world's largest sales training organization and the world's largest networking organization share their insights. Get this FREE 68-page e-book and learn the secrets to leveraging the world’s largest online professional network to find prospects and increase your sales. A must-have book for any sales professional who wants to maximize his or her prospecting efforts using LinkedIn. Small to mid-sized businesses are typically looking for immediate change and results, supported by ongoing reinforcement to permanently instill best practices. Find out how to improve your sales now. Selling into large accounts can be a huge challenge, entailing long selling cycles and significant up-front costs. Systematizing the enterprise selling process keeps things efficiently moving forward to predictable outcomes. Find out how we can help your sales team win enterprise business. Sales and management sessions provide invaluable insights, skills, strategies, and improved numbers which are supported 24/7 by online content and tools that further engagement and sustainable change. Find out about our Online Solutions. Attorneys, CPAs and other professional service providers develop effective processes and systems to identify, qualify, and develop new business opportunities, without becoming "salesy." Learn more about how we can help you build a successful practice. Properly trained frontline staff significantly add to client retention as well as additional sales. Customer Support teams learn how to provide exemplary service while recognizing and maximizing opportunities for up-selling. Find out how to maximize your customer service team's productivity. Learn how to identify the barriers that are blocking your paths. The Sandler library covers all topics you need to successfully grow business, including sales, sales management, and leadership. Two Amazon and Wall Street Journal best-sellers, as well as the best-selling sales classic for any sales book ever, demonstrate that we know what we’re talking about.